The project aims to improve humanitarian practice by developing an innovative intervention targeting intimate partner violence (IPV) among a Muslim refugee population and delivered in the context of a cultural or community practice. IPV is hypothesized to be the most common form of gender-based violence in humanitarian settings, and has serious social, economical and health consequences, particularly in the context of displacement. 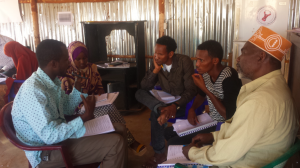 This innovation will actively engage the targeted population within the Dollo Ado refugee camps of Ethiopia and assist them to question, challenge and transform norms that may lead to IPV. In our last blog we shared the exciting participatory learning methods and the innovative ideas that we intend to employ in our qualitative data collection and left promising to share more news from the field. In this blog we will share our experience conducting fieldwork in Bokolmayo refugee camp in Dollo Ado, Ethiopia. We want to highlight how we strengthened research capacity among our data collectors, most of whom had some experience collecting quantitative data, but limited experience in collecting qualitative data. Our research team traveled to the project site and collected qualitative data needed as an input for the intervention development process. 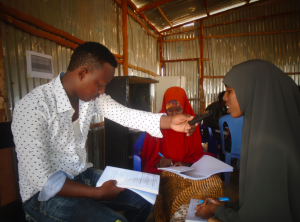 A first step was to build the capacity of data collectors and note takers selected from both the refugee and host communities by enabling them to collect high quality qualitative data using in-depth interviews, focus group discussions and participatory learning activities. The research team included the participatory methods in order to expand the data collection, ensure diversity of perspectives and to better inform the curriculum adaption process. As a result more time was given to our data collectors to practice the participatory approaches and help them build their confidence in collecting useful and quality assured data. Practice interviews. Qualitative data collectors training by Samuel T.
Given the limited supply of more experienced qualitative data collectors at the time of recruitment, our field team dedicated more time to building the capacity of the qualitative data collectors, covering every “how to” and giving them more practice time to get familiarized with the data collection tools and instruments. Among the three data collection approaches employed in the field, the concept behind participatory learning methods was not easy for our data collectors. Not only were our data collectors not familiar with this concept, but also qualitative data collection was a new technique in this remote area. As indicated above, our data collectors were only familiarized with quantitative data collection methods with most previously participating in one or two day training. Qualitative data collectors training by Samuel T.
Following enhanced training, our team of data collectors continually improved as they collected data. Data using the three approaches was collected on a daily basis. At the end of each day, quality assurance procedures were followed where the entire team discussed one sample audio recording, provided constructive feedback and identified follow up actions to ensure the application of the feedback. As a result, we observed each day the enhanced abilities of data collectors, including improved confidence, maturity and ability to engage participants. Our research team invested time in training and observed growth from static data collection to a more dynamic process. The data collectors developed into humble, charming, and friendly facilitators who could elicit more information from respondents on sensitive issues. Now we have the long-awaited data at hand. Our next step will be to give life to this information and we will be focused on transcribing, translating, coding and analyzing the data in order to use the findings in the intervention development process. We will be sharing more on this in our next blogs.